Usually planned in the day working hours, under IV sedation which will not harm the eggs. 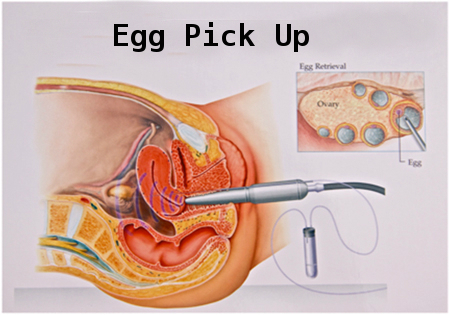 An Ultrasound machine is used to pick up the eggs through vaginal vault using a specific instrument called TRANSVAGINAL PROBE with It`s guide through which the egg pick up needle is introduced and the follicle is punctured. The needle system is a complex one having two ports, one for aspirating the follicular fluid and the other one for flushing the empty follicle with specific medias. This needle system is connected to a low power suction motor which aspirate the fluid very gently without harming the eggs. The aspirated fluid which contains the eggs are collected in a Polystyrene test tube and sent to the adjoining IVF lab. The aspirate is examined by an embryologist under stereozoom microscope to identify the eggs and keep them separately in an ideal nutritious culture media in incubator till they are inseminated. This identification, separation and , handling needs an ideal gas mixture and warm(37*c) environment under a sterile zone called Integrated Laminar Flow Work station. The whole procedure takes maximum 30 minutes and the amount of bleeding or pain will be very minimum.